Tighman Northcraft established a store here in the 1860’s and served as Justice of the Peace from 1872-1875. A post office was established in 1905. The name Northcraft was applied to the post office, store and village. The first postmaster was Tilghman’s son, Amos Northcraft. Another son, Vernon Northcraft, was postmaster for thirty-three years, followed by his son, Theodore Tilghman Northcraft. The post office closed in January 31, 1941. The farm is still worked today by the fourth, fifth and sixth generation of Tilghman’s descendants...Edward “Eddie”, Shawn and Ben Northcraft. 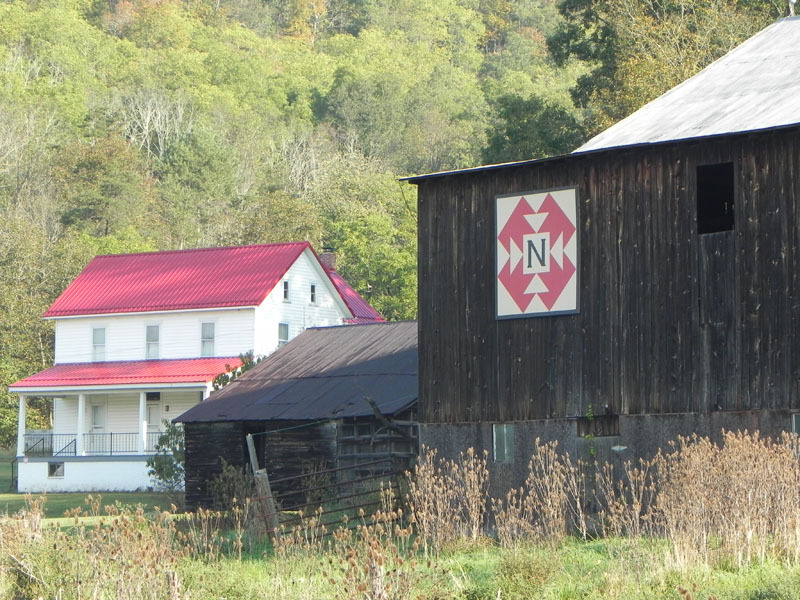 It was decided to use a capital T quilt pattern for this barn quilt because of Tilghman Northcraft and Theodore Tilghman Northcraft who inherited the farm from his father, Vernon Northcraft, Tilghman’s son. The farm was later inherited by Theodore’s daughter Audrienne and her husband Donald R. Witsel. The capital N in the center block represents ALL the Northcraft Family.